Symfony Gets Real-time Push Capabilities! Because the most popular PHP SAPIs aren't able to maintain persistent connections, Symfony wasn't providing any built-in method to push data to clients until now. It was mandatory to rely on external service providers or on other programming languages to implement such feature. This time is over! Say hello to the Mercure component and to the MercureBundle! 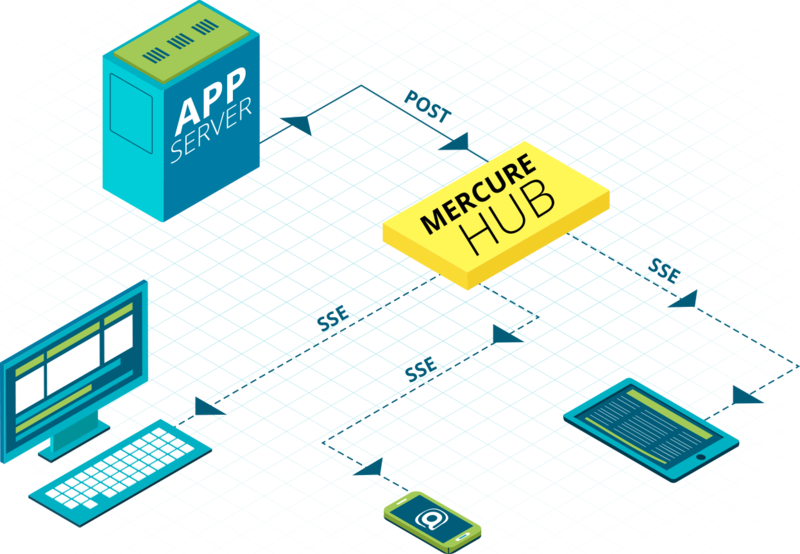 As their names indicate, they implement Mercure, an open protocol designed from the ground up to publish updates from server to clients. It is a modern and efficient alternative to timer-based polling and to WebSocket. All these features are supported in the Symfony integration! Now, set the URL of your hub as the value of the MERCURE_PUBLISH_URL env var. The .env file of your project has been updated by the Flex recipe to provide example values. Set it to the URL of the Mercure Hub (http://localhost:3000/hub by default). In addition, the Symfony application must bear a JSON Web Token (JWT) to the Mercure Hub to be authorized to publish updates. This JWT should be stored in the MERCURE_JWT_SECRET environment variable. Because the array is empty, the Symfony app will only be authorized to publish public updates. As you can see, you don't need any JS library or SDK. It just works! Google Chrome DevTools natively integrate a practical UI displaying in live the received events. Test if a URI Template match an URL using the online debugger. You should also configure a transport (if you don't, the handler will be called synchronously). As showcased in the previous recording, the API Platform Client Generator also allows to scaffold complete React and React Native apps from this API. These apps will automatically render the content of Mercure updates in real-time. There is more! Symfony leverages all the features of the Mercure protocol, including authorization, discoverability through Web Linking and advanced SSE configuration. Checkout the brand new Symfony Docs articles about Mercure to learn all the details! Probably one of the best news of the month! Really great job !! Thank you for this feature ! Really great ! Thank you ! Excellent news! After messenger another component making the Symfony ecosystem that more complete. Excellent !! Symfony gets real time Push Capabilities! I've been waiting for this for a long time. Thanks. Awesome. Minor issue: The SSE link to Mozilla in this post links to the French page. Amazing feature that act like Laravel Broadcast. A missing thing in Symfony world :D Thank you ! Awesome! This is a long needed and very welcome feature. Thanks! But why hack this on top of h2, instead of using a protocol specifically designed for job? E.g. WebSockets. Amazing... Can't wait to play with it! it does not work for me, when i want to notify a particular user, i can not transfer the cookie that has been generating to my hub.